One minute, a sold-out crowd of 600 is sitting itself down in a ballroom for dinner and, the next, it’s surrounded by dancers masquerading as forest creatures, moving with such pride, passion and zest for life that one had to remember to breathe while watching the elaborate production unfold. That the aboriginal cultural performance was such a thrill came as no shock. What was surprising, however, is how the dancers and drummers continued to elevate the talent bar impossibly high at the annual Igniting the Spirit Gala, held Wednesday at the Ottawa Conference and Event Centre, on National Aboriginal Day. The show was choreographed by Anishinaabe dance artist Christine Friday. It blended mainstream and traditional Indigenous dance styles, featuring an aerialist, local ballet dancers and a host of Indigenous talent from across Canada. “It was so beautiful,” Sophie Grégoire Trudeau, wife of Prime Minister Justin Trudeau, told OBJ.social after the show was over and the last of the colourful confetti had dropped on stage. “They keep outdoing themselves every single year." Grégoire Trudeau, who was the evening’s guest speaker, attended the gala with her eight-year-old daughter, Ella-Grace. They were seated at one of the dinner tables adorned with home-made animal masks, numbering 600 in total. She spoke from the heart about Canada 150 and how we must look back at the stories that have shaped us as people and as a nation. The most important thing for us to move forward as a country for the next 150, she added, is to have love for ourselves and for one another. Grégoire Trudeau donated for auction a silver and bronze bracelet cuff, created for her to wear that night by Halifax artist Tanya Milne. It sold for $850. Each year, the evening raises more than $150,000 for the Wabano Centre for Aboriginal Health, an award-winning healthcare facility located on Montreal Road. It offers programs and services with a community-based and holistic approach. The organization is led by the highly regarded Allison Fisher, seen at the gala with her movie-star good looks. The gala's gold sponsor is RBC. In keeping with this year's Trickster gala theme, Fisher shared the story of how rosebushes got their thorns in order to highlight her message of reciprocity, and that true reconciliation includes the spirit of reciprocity. Barbara Farber, president of Leikin Group, was back to co-chair the organizing committee with Ottawa Police Chief Charles Bordeleau, who said he's proud to associate himself with Wabano. Farber got hooked on the organization after her initial plan to drop into the centre (at the suggestion of former deputy police chief Sue O’Sullivan) resulted in her spending an entire afternoon there. She and Bordeleau have been co-chairing the gala for the past five years. One may not automatically link the aboriginal community with the Jewish community, said Farber, who is both a prominent Jewish businesswoman and volunteer fundraiser. “People say to me, ‘You're a member of the Jewish community. Why do you come to Wabano?’” said Farber, while adding that she can relate to being part of a minority group, and to the importance of surrounding oneself with people of shared values, culture and history. “It makes you walk into the general community with your head held a little higher, because you know who you are,” said Farber. Canadian comedian and mental health advocate Mary Welsh was back as the evening's special guest and to help peddle raffle tickets for a first-class Via Rail trip for four to Halifax. 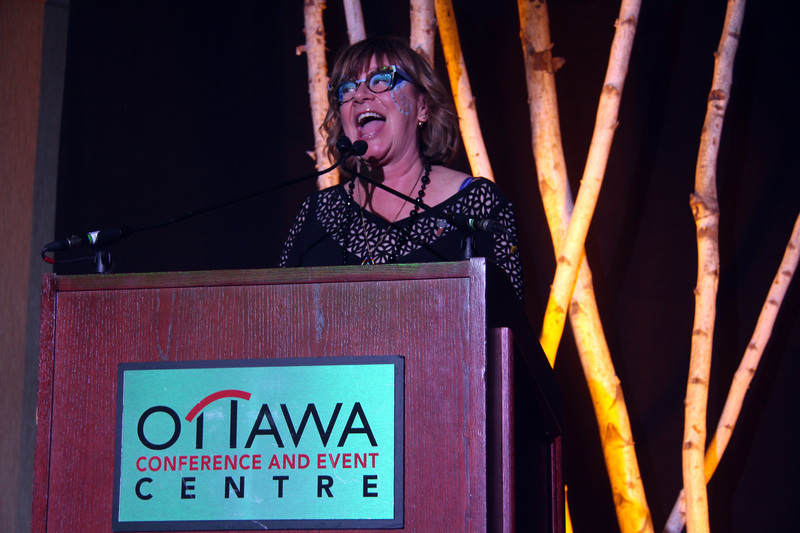 Also returning was CBC’s Shelagh Rogers as emcee, for her fifth time.